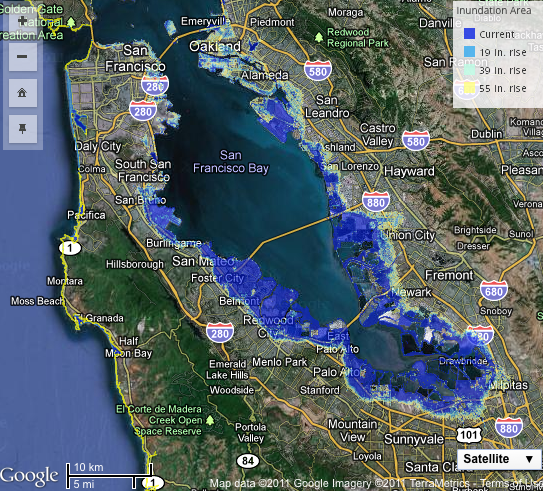 Google Maps image of the Bay Area from Cal-Adapt’s online interactive sea level rise tool. Developers building on the shore of San Francisco Bay will now have to consider climate change in their plans. Despite a unanimous vote on Thursday by the Bay Conservation and Development Commission (BCDC), it hasn’t been easy planning process for the state agency that regulates development along the San Francisco Bay shoreline. The state agency approved a first-of-its kind policy that makes sea level rise part of regional planning decisions. “It’s kind of like childbirth,” said Will Travis, the Executive Director of the commission. The new rules require developers to plan for rising sea levels in their proposals for waterfront property. Business groups and cities cried foul when the policy was first released, saying it would hurt economic development. Travis says they tried to strike a balance. State scientists studying our changing climate, say that sea level could rise nearly six feet by the end of the century. It’s about time. We know it is going to happen. The only questions is whether we plan now, or roll the dice that “it won’t be that bad.” :Planning now will take a load off our our children as they won’t have to pay for our overconfidence. One of the projects that I have always questioned is Treasure Island. The City of San Francisco keeps coming back to that and still does not have a solution. What I have seen involves using UN IPCC estimates for sea level rise Those are a few years old and since then, we have seen rates of warming that exceed the IPCC numbers. If that continues, and there is no reason to think otherwise, then the 2050 or 2100 numbers are wrong. Note: average sea level dropped this past year some 6 mm due to the amount of evaporation that comes with higher temperatures. This was the faucet that opened to flood Australia, Pakistan, Mississippi River and turned Hurricane Irene into at rain event with record precipitation. I would have hoped that some projects would have required insurance against climate driven sea level rise. The cost of that would surely make many projects unfeasible. Use to be a large body of water called Mission Bay. It overlooked a small island in the main SF bay called Mission Rock. Where are they now? Not on the map anymore. Were they inundated by the claimed 8 inches of sea level rise that supposedly (according to Jerry Brown’s stable of political “scientists”) occurred between 1900 and 2011? I love the disclaimer attached to the sea level maps Lauren links to. Users agree to hold harmless and blameless the State of California and its representatives and its agents for any liability associated with the use of the maps. Expecting lawsuits much? That’s what happens to liars. Prev Drought Gone, Less Support for California's Water Bond? Next Should California Put Hybrids Back in the Carpool Lane?